"A tasty seafood dish you must try!" 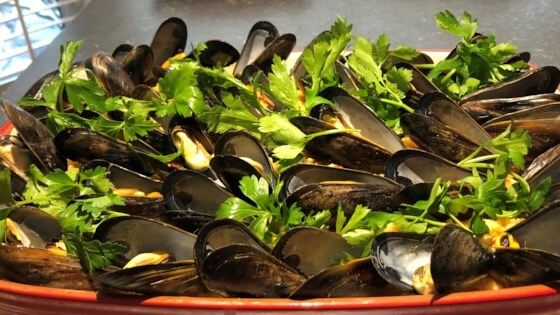 In a pot of lightly salted water, boil the mussels until they open. Drain, and discard unopened mussels. In a separate pot of lightly salted water, boil the prawns and squid until opaque, 3 to 4 minutes. Drain, reserving liquid. Heat olive oil in a large skillet. Place chicken pieces in the skillet, fry them until they are golden brown. Remove the chicken pieces from the skillet and set aside. Place garlic, peppers and tomato cubes into the skillet that the chicken was just removed from. Fry the vegetables until they soften. Bring the fish stock and 3 cups salted water to a boil and mix in 3 cups rice, saffron and paprika. Bring to a boil again. Cover, reduce heat and simmer for 50 minutes or until rice is tender. Stir the peas into the rice. Pour the rice mixture into a large serving dish. Arrange the fried vegetables, chicken, shellfish and prawns around the rice. Serve hot. Chicken, sausage, and shrimp shine in this easy, flavorful Spanish rice dish. I replaced 1/2 cup water with white wine and soaked the saffron in it before adding (I learned this from a Spanish friend)-terrific! yummy but the recipe 'Bring the fish stock and 3 cups salted water to a boil' doesnt say how much of the fish stock to use. so i just estimated and it came out a bit moist.